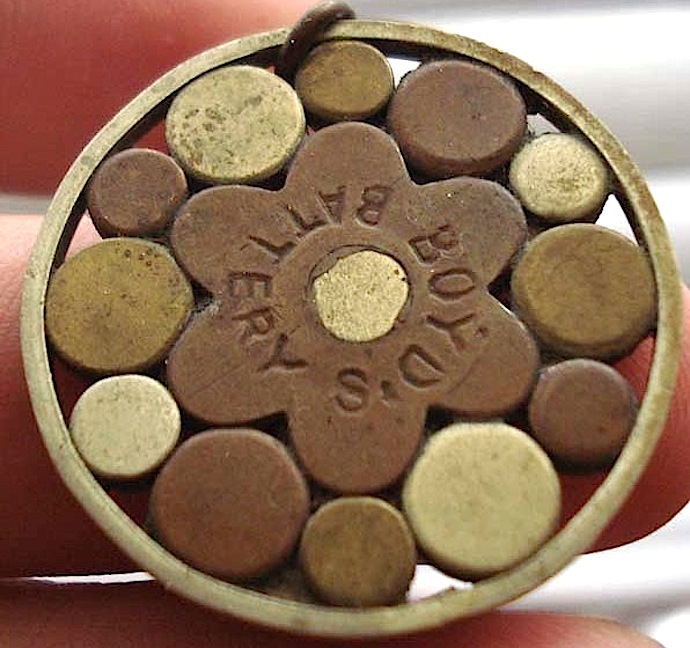 I have always been interested in the quirky finds sometimes unearthed by detectorists and last discussed these in 2011 with a blogpost entitled Snake Oil Surprises. Now Lost. Today’s post involves a ‘Galvanic battery’. I’d never heard of one before … it makes interesting reading. J C Boyd claimed that his miniature device (above) should be worn around the neck., preferably over the heart. The battery (supposedly) worked by ‘Galvanic action’ due to the ‘union of metals.’ We all know that in a common battery the effect is usually facilitated by an acid, but Boyd’s device needed only ‘the natural humidity of the skin’ to cause a beneficial flow of electricity in the blood … so he claimed! The combination of different metals (usually copper, brass and nickel) in contact with the natural humidity of the skin was said to produce a beneficial electric current that would purify the blood and safely cure any number of conditions, including headaches, rheumatism and toothache. If only! ‘Professor’ Boyd had many imitators. Some of these were former employees that struck out on their own while others were simply opportunists. Boyd patented his battery on January 17, 1878 in the United States followed by a British patent the following year. The Pitt Rivers Museum in Oxford has a similar amulet in their collection. Although the battery is fairly common, the paperwork is next to impossible to find. Jeff Behary, curator of the online virtual museum at electrotherapy museum has kindly allowed me to use one of his pictures of the device. There is also a comprehensive advert with testimonials for the device and other examples of quackery – and after reading all that I want one of everything. 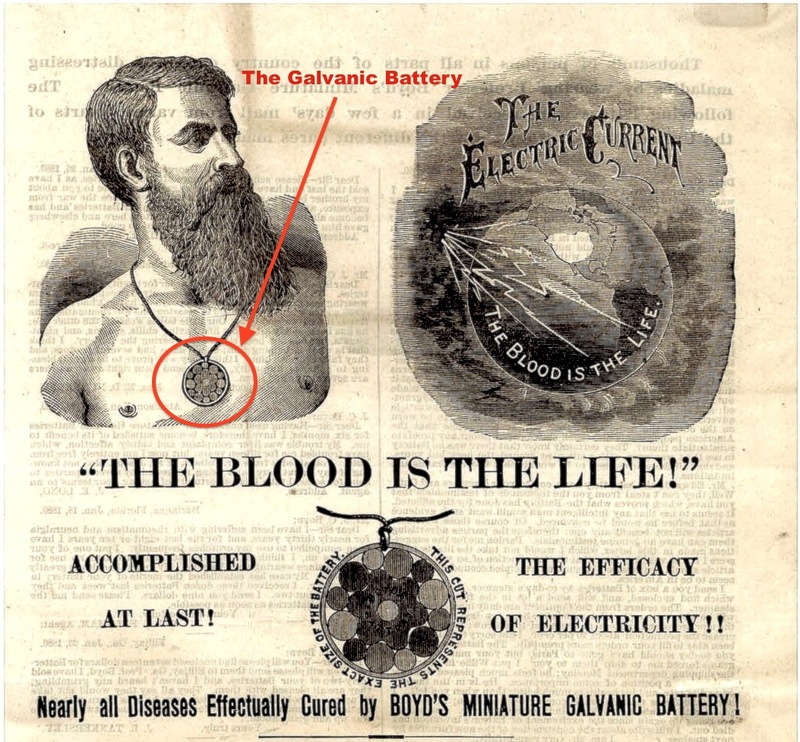 I don’t know what it was about earlier times but from my researches it seems that in the second half of the 19th century onwards, there was a lot of advertising for quack medicines and devices mentioning Galvani or Galvanic. Were people more gullible then than they are now? Luigi Galvani is a name I remember from the time I was an electrical apprentice. I recall that in one of his experiments he was able, by way of an electrical charge, to make a frog’s leg twitch even when it was separated from the body. Learn more about him HERE. But, I’m waiting for the day when a detectorist unearths a rather obscure ‘galvanic’ quack device called the ‘electrical spectacle’. I hope that they see me first, because the device fascinates me. I also suppose the chance of uncovering a magneto shock box is out of the question! There’s always an ever ready supply of poor zaps for this kind of electrickery! Varta laugh… makes me go all TENS (at least that works!) Those old adverts are just brilliant though! I would have said if anything we’re worse, judging by the amount of digital snake-oil embrocating the internet! But surely we knowledgeable detectorists are immune, eh? Thanks John – your articles are great springboards for some enjoyable googling! Cheers! I wonder if they were the early versions of Electric Shock Therapy. Another great blog post and it brings to my mind when I was a kid my father had an electric hand operated electric generator which had a 2″ wide grooved roller and he would roll up his arm this chromed steel object which was about 6″ long and had an electric lead to a mushroom like end and this end was placed on the painful area for treatment and the faster he rolled the thing the greater the electric shock, I think it would be a collectors item now. Hello John, that bit of kit is very similar but not identical. I will ask my sister if she kept it when she cleared the house after my parents died. These electronic devices sound much like the magnetic bracelets that were all the rage a few years ago that were supposed to cure arthritis, if only they worked too, maybe my knees and hips would allow me to do a full days detecting ! They just left most people feeling sick. Well I’ve learned something new again! Thank you john. I guess back in those days when medicine and indeed electricity were in their infancy people were far more gullible?? OR WERE THEY?? My Grandad used to put a magnet in his bed for cramp and he swore that it worked! And two of my Uncles used copper bracelets with magnets in them for rheumatism and said they worked too!! I suffer from terrible cramps, but refused the medication that was offered … long story! Takes me back many,many years to when I got a “shocking coil” from a jumble sale,took it to school !!! and had it confiscated because I upset too many of the gullible other kids!!! !